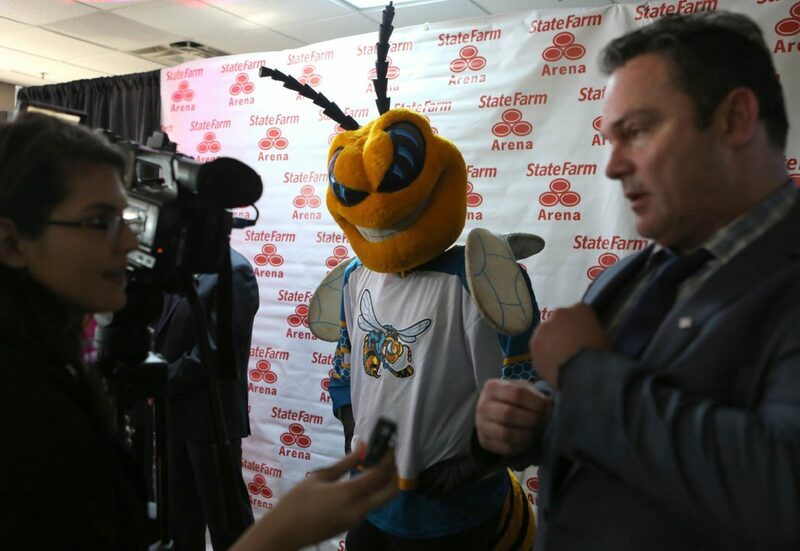 Killer Bees hockey mascot "Sir Sting-a-Lot" stands by as the new owner Bill Davidson is interviewed following an announcement of the team's return to the State Farm Arena Wednesday, March 21, 2018, in Hidalgo. The team will play in the USA Central Hockey League, with an expected start date in October this year. HIDALGO — Nostalgia was in the air, but so was fresh excitement with Wednesday’s announcement that the RGV Killer Bees would be returning to State Farm Arena in Hidalgo for the 2018-19 season. The third iteration of the Killer Bees will play in the USA Central Hockey League, a newly formed junior league that will also operate in Hidalgo. Wednesday’s news conference at the arena opened with the familiar intro video that has welcomed the Bees onto the ice since their inaugural home game on Oct. 31, 2003. After a cameo from mascot Sir Sting-A-Lot, the group spearheading the return looked to the future. Former semiprofessional hockey player Bill Davidson will own the team. Davidson, a native of Vancouver, Canada, who most recently lived in the Corpus Christi area, is hoping to provide entertainment for the remaining hockey fan base while making new community inroads. Rick Kozuback talks about the formation of the USA Central Hockey League during a news conference Wednesday, March 21, 2018, at the State Farm Arena in Hidalgo. Kozuback will be the commissioner of the league, which will be based out of McAllen. Rick Kozuback, who was instrumental in attracting the sport to the area for the first time in 2003, will serve as the league’s commissioner. Kozuback, another Canada native, said the hard work to attract the franchise and build the arena in the early 2000s made Wednesday even sweeter. He’s hoping to recreate the excitement that surrounded the first iteration of the franchise, which played in the Central Hockey League at the minor league professional level from 2003-12. The State Farm Arena will part ways with longtime tenant the RGV Vipers after this season as the hoops team moves to the yet-to-open Bert Ogden Arena in Edinburg. 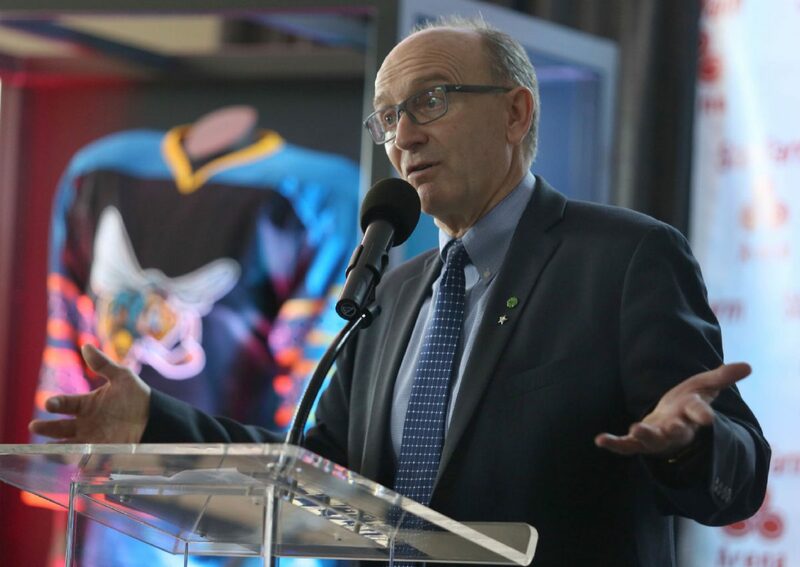 The league will be a U-20 junior organization — similar to the latest version of the Bees that competed in the North American Hockey League for two seasons before ceasing operations in 2015 — but hopes to mirror the rules and speedy style of the National Hockey League. Davidson said he’ll be leaning on his western Canadian connections to fill out his roster and front office staff. The USA CHL will have a hand in the management of the team, which Kozuback and Davidson hope will help strengthen both entities. The league will launch in the 2018-19 season with six teams. Play is expected to run from late October through March. Each team will play a 60-game schedule, and State Farm Arena will host 30 regular season home games. The renewed rivalry with the Laredo Bucks also looms on the horizon, as an announcement similar to Wednesday’s is expected in Laredo down the line.